It is spring in Minnesota. The trees are a blinding neon green, flowers have begun to pop up, and the weather has been vacillating between hot and humid, brisk and windy. Today it is cloudy and, dare I say it, almost cold, though I might just be suffering from a case of post-California-wussiness. I have my parents' house to myself this weekend, and it's reminded me just how much I value being alone. Last night I blasted music while getting ready to go out with some friends; I danced through the halls naked and singing at the top of my lungs. This morning I woke up early and put Norah Jones on the multi-room speakers so that her music spread throughout the whole lower level of the house. I made myself breakfast, did the dishes, cleaned the kitchen, and now I'm sitting and drinking tea while my laundry churns in the dryer, staring at this blank page. Sometimes writing a new post can take me days. I have so many thoughts in my head that it's hard to know where to begin, and I often wonder why I even feel compelled to share them in the first place. I think a big part of it has to do with the desire to be known, to be understood, and to know and understand others in return - the moments when someone responds to something I've written with "Me too", or "I've been there", are edifying and soul-affirming, and I've become addicted to the connections drawn from honesty and vulnerability. But in order for me to understand myself well enough to write about my feelings and make those connections, I first need to be alone. I can be by myself for extended periods of time and be perfectly content, because I love the freedom of doing whatever I want whenever I want. That, and sometimes I need to just sit and be with myself. In this day and age, it's easy to feel as though I'm alone while there's no one else around and I'm on my phone, staring at everyone else's lives and reading think pieces and listicles coming in from all corners of the earth. But that's not real aloneness. To truly be alone, to just exist as a human being and get to know myself, is a much rarer experience, and one that I cherish, and which requires disconnecting (and often, for me, driving). Also, periods of alone time make finally being in the company of loved ones that much sweeter, which, I think, is why I chose to take the long way home and make it a solo mission. After traveling across the entire state of California in a day, I ended up in Truckee, a place with which I have had a long distance love affair for a couple of years. The funny thing is that I had never actually been there; I had only heard of it through some of the adventure and outdoor blogs I follow, as well as through word of mouth. All reviews had been positive, and I was pretty confident that I was going to be enamored with it. That's one of the beautiful things about the years slowly adding up; you begin to know yourself - like really, really know yourself - to the extent that you can trust your intuition, even from afar. I arrived late and in the dark once again, and the owners of the cozy cabin Airbnb I had booked were kind enough to wait up for me and sit with me while I ate dinner. They told me about how little precipitation they had gotten this winter because of the drought, but said that snow was forecasted to fall overnight. 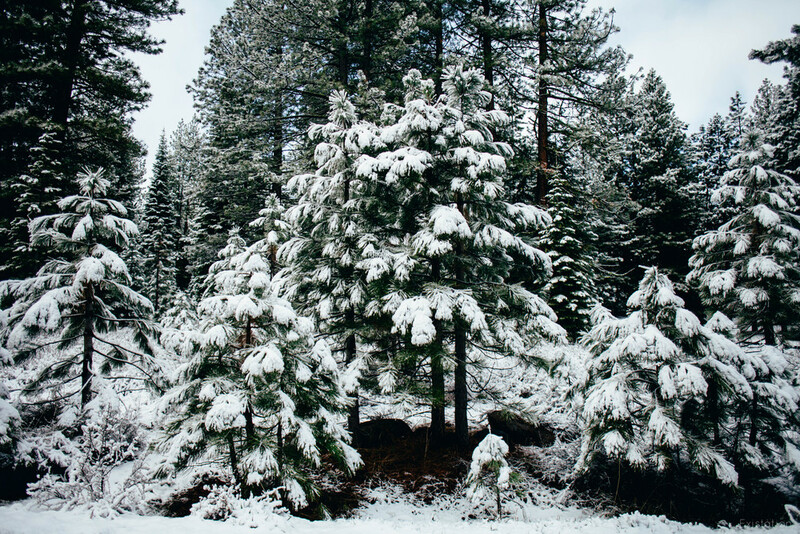 I woke the next morning, looked out the window, and voila: a thick layer of white rested on the towering pines. Truckee must have known I was coming. My time there was painfully short, mostly because I was so, so, so correct about how much I would love it. It is small, it's in the mountains, it's in California, it's not far from the desert, or Lake Tahoe, or my precious redwoods...and I mean, just look at it. You can't really go wrong. My father once traveled to Cinque Terre, Italy, and told my mother that if he ever went missing, she'd know where to find him; if I ever disappear, I'd suggest making Truckee one of the first places you look. I headed out of Truckee and towards Tahoe, beginning another long day of driving, which was entirely my fault because of how many times I stopped to take photos along the way. 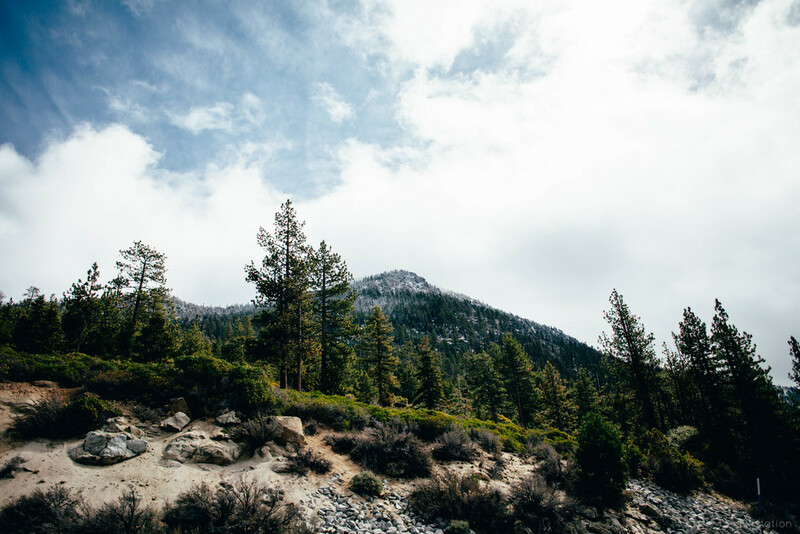 I spent almost the entire morning driving around Lake Tahoe, pulling off the road at every scenic overlook, wandering onto frozen beaches, and ogling as snowstorms made their way across the lake, white sheets of snow and ice falling in the distance as the sky over my head gleamed blue. It was alternately bright and dark as the sun dipped behind an occasional snow shower and then peeked back out again. The wind buffeted me from every direction, so I left the car and heat running at full blast while I jumped out, holding my hat onto my head so it wouldn't fly away, and hopped along giant boulders to get a couple of pictures down by the water. I smiled and waved at the few other people brave enough to venture out and take photos on such a blustery day; I saw the same adorable, mountainy-looking couple at multiple locations, juggling various lenses and camera bodies, and eventually the guy called out to me, "Beautiful day to spend at the beach, yeah?!". I laughed in agreement as a gust of wind almost knocked me off my feet. And then came the desert. Oh, the desert. At this point in the day I was running much further behind than planned; I had created the lofty goal of getting from Truckee to Moab in one shot, an eleven-hour drive without stopping, but seeing as I was departing Tahoe at about 11:30am, I knew there was no way I could handle the distance. So I booked a room in Salt Lake City and sped my way across Nevada, stopping only to go to the bathroom, fill up on gas, and take a couple pictures of a ridiculous dust storm - an undulating, windswept mass that entranced me into staring at it for about fifteen minutes as it silently blew west, hit a mountain, reversed course, grew and shrank, and trailed off into a series of smaller dust storms across the scorched earth. 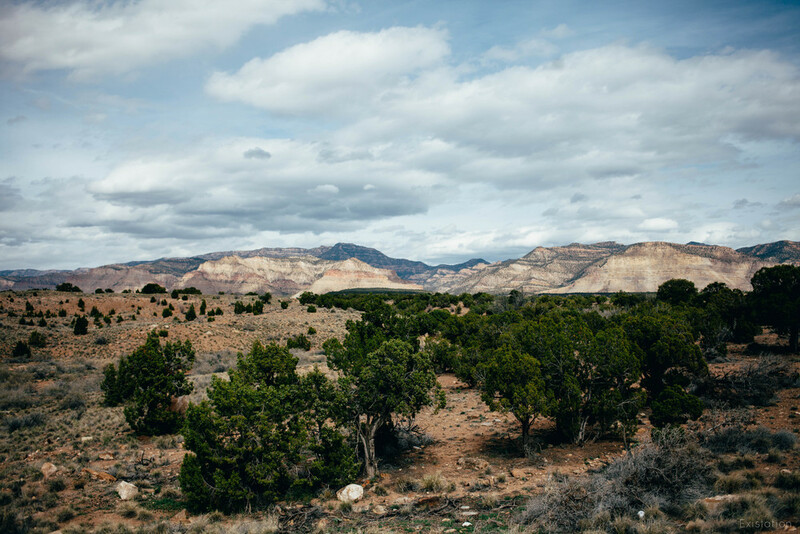 Utah was gorgeous and I had no time for it, which made me incredibly sad. I missed the Great Salt Lake by arriving in Salt Lake City late at night and discovering it would take an hour of backtracking to see the lake the next morning, so I skipped it and chose to take a brief detour through Park City instead. The northwestern portion of Utah is an amazing mix of brown, green, and tan desert and snowcapped mountains that look entirely out of place in such a desolate landscape, and then you randomly find yourself driving alongside a giant, curvy lake, and you're confused, but you're tired, so you accept it and keep on keeping on. I finally ended up in Moab, and spent a day exploring Arches National Park...but I'll save those millions of pictures for the next blog post. I'm finally getting close to the end of the trip!